Spaying or neutering your dog or cat is one of the most important things you can do for the health of your pet. Spaying or neutering an animal prevents unwanted pregnancies and litters. Having your pet spayed or neutered can also improve its health and behavior. Spaying and neutering companion animals prevents unwanted pets from struggling on the streets or winding up in shelters. Each year, about 3.9 million dogs and 3.4 million cats enter animal shelters in the United States. Sadly, many of these pets are put down, as shelters are often overcrowded and underfunded. Having your pet spayed or neutered helps ensure that every dog and cat has a home. Spaying or neutering your pet also ensures that your animal companion is happy. Female dogs and cats that go into heat experience agitation and frustration, as instinct drives them to reproduce. Pets in heat also experience a compulsion to mark their territory by spraying urine; indoor pets often spray on furniture, walls, or your personal items. Unneutered male pets also mark their territory by spraying urine. Animals that have not been spayed or neutered tend to be more aggressive, which makes them dangerous to humans and to other animals. They can even sustain serious injuries from fights. Dogs and cats sometimes wander great distances in search of a mate. This wandering puts them at greater risk for pregnancy, fights, injury from car accidents, and becoming lost. Spaying or neutering your dog or cat helps your pet remain safe and happy at home. Our veterinarian in Oakland neuters a male animal by removing the testicles through a small surgical incision. This procedure prevents the production of sperm, so the male animal cannot impregnate a female dog or cat. Neutering your pet will eliminate behaviors related to breeding, such as wandering and aggressiveness. The spay procedure involves the removal of the animal’s ovaries, uterus, and fallopian tubes through a surgical incision. Spaying prevents the female’s reproductive system from producing eggs or sustaining a pregnancy. The procedure eliminates the heat cycle and stops any instinct-related breeding behavior, such as wandering or trying to get outside. Spaying and neutering will also alter your female pet’s hormonal balances in a way that reduces the risk of breast cancer, which is fatal for one-half of all canines and up to 90 percent of all felines diagnosed with the disease. Removing the reproductive organs prevents the development of disease in these organs, particularly cancer. When should you get your dog or cat spayed or neutered? Our veterinarian in Oakland Park suggests having your pet spayed or neutered when your dog or cat is young, before health issues and behavioral problems set in. Having your female pet spayed before her first litter reduces her risk for uterine cancer, other cancers of the reproductive system, and potentially fatal uterine infections. 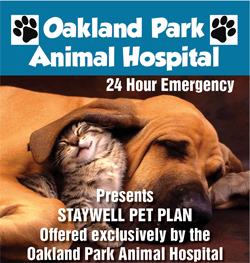 If you are considering having your dog or cat spayed or neutered, contact Oakland Park Animal Hospital. Our veterinarian in Oakland Park has the advanced veterinary expertise and equipment to prevent unwanted pregnancies and litters. 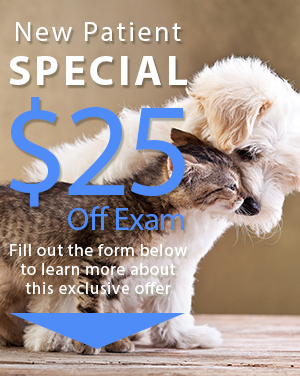 Oakland Park Animal Hospital is conveniently located at 2200 West Oakland Park Blvd. in Oakland Park, FL. We also serve those in the Fort Lauderdale area. Make an appointment today to have your dog or cat spayed or neutered at Oakland Park Animal Hospital by calling (954) 731-4228.